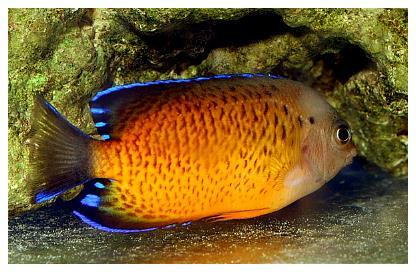 Of all the fishes available to marine aquarists, the angelfishes are certainly some of the most desirable. 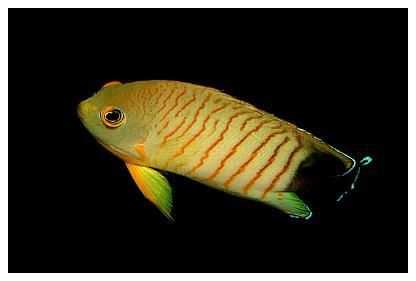 Coming from the warm waters of the Caribbean, Red Sea, Indian Ocean and Pacific are numerous attractive and interesting types to choose from, including over 30 species from the genera Centropyge and Paracentropyge. 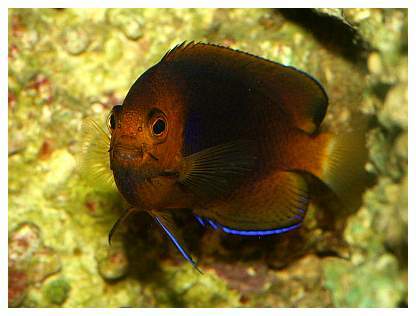 Although many angels can grow much too large for life in anything smaller than the biggest home aquariums, the members of these two genera are much smaller in size, are far more suitable for the typical home aquarium, and are appropriately called the pygmy or dwarf angels within the hobby. 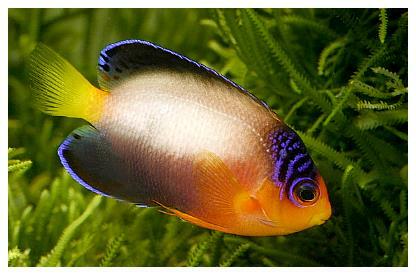 These pygmy angels are especially popular, and many of them make great additions to an aquarium because most of them are quite beautiful and are generally hardy, too. So I want to go over the basics of the bunch in order to give you a good idea of whether any of these is right for you and what they’ll need to stay happy and healthy. For the most part they’re easygoing and easy to care for, but there are some exceptions, and there’s plenty to know before trying one in your own tank. Centropyge potteri. Photo courtesy of Travis Staut. Pygmy angels eat primarily algae and detritus, but some species also eat sponges, tunicates and various other small invertebrates. At times, some eat the mucus produced by corals and tridacnid clams. 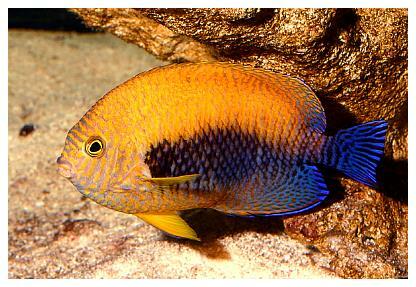 When kept in aquariums, however, they typically adapt in a short time to a diet of just about anything provided. Most species don’t hesitate to take various meaty foods, brine shrimp and flake foods, but it’s best to provide them with some other types of foods, too. Because they’re primarily grazers in the wild, they should be provided with some greenery in their aquarium diet. This includes anything from fresh vegetables, such as spinach or broccoli, to dried seaweed products such as sushi wrap/nori, specialty frozen food cubes made for algae/sponge eaters, spirulina flake food, algae pellets, etc. Having plenty of healthy live rock and/or other algae-covered structures also helps to keep them at their best, because they can nibble algae off its surface just like they do in the wild. 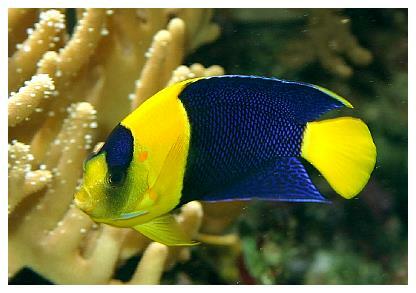 When it comes to space requirements, a few of the smaller species are actually suitable choices for small reef tanks less than 30-40 gallons in volume, as long as the tank isn’t occupied by too many other fishes. Having more space to move around is always better than less, though, and having plenty of shelter is very important for pygmy angels, too. 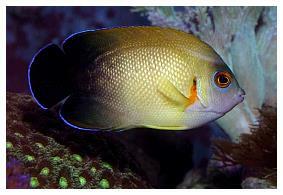 These diminutive fishes are preyed upon by larger predatory fishes on the reef, and are thus somewhat skittish at times and like to have ample hiding places to duck into. So, there’s another good reason to have plenty of live rock in an aquarium housing a pygmy angel, as it can be arranged in ways that create spaces for these and other fishes to swim through, and to hide in when they feel the need. Likewise, any non-reef hobbyist who doesn’t use live rock should still provide them with plenty of other sorts of decorations and suitable refuges. 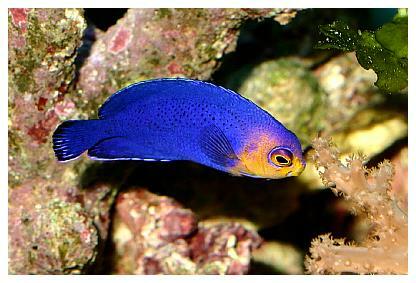 As far as compatibility with other fishes goes, many (but certainly not all) pygmy angels get along fine with other sorts of fishes (that won’t eat them), such as tangs, wrasses, gobies and blennies. The same cannot be said, however, for their compatibility with other pygmy angels. 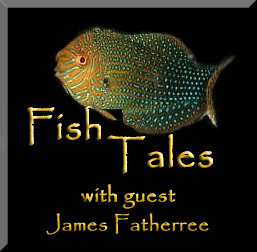 As always, every individual fish of a given species can have a distinct personality, with some being more peaceful than others but, for the most part, trying to keep more than one pygmy angel in a small aquarium is a bad idea. They tend to be quite territorial and, in most cases, two or more pygmy angels will not get along at all. This is especially true if more than one individual of the same species are kept together, which is often impossible in most tanks. They usually wind up endlessly harassing each other. Photo courtesy of Travis Staut. Still, in large tanks (100+ gallons) with plenty of structures and hiding places, there’s a much greater chance of successfully keeping more than one pygmy angel. Individuals need to be able to avoid each other when they want to, so giving them plenty of room and shelter is the key. However, I do have to say that even in tanks this size, I’ve had some that just wouldn’t get along no matter what. Sometimes individuals can be particularly aggressive no matter how much space (i.e., territory) is provided. I’ll also add that if you do plan to try to keep more than one in a tank, it’s best to add all of them at the same time. As is the case with many other fishes, if only one is added first, it may decide that the whole tank is its domain, and be less likely to tolerate the addition of any other pygmies added later. About the only other thing to mention here is that some species of pygmy angels do form mated pairs and others may form harems in the wild, but in all my years in the hobby I don’t recall seeing a mated pair offered together at a shop even once. So, the bottom line is that if a large aquarium is not provided, it’s probably best to stick with just one pygmy angel. I’ve known more than a couple of hobbyists who tried to keep more than one, and ended up having to practically tear their tank down to remove one of them later. Shopping and Quarantine: As always, make sure that any potential purchase looks healthy, is active and is eating well. It should be obvious that you should never buy any fish that looks sick, but seeing that it is feeding is very important, too. Unless you just feel like risking the lives of all of your other livestock, a month-long quarantine is also a must. Keep these and any other fishes out of your main tank until you are sure they can’t bring in an unwanted problem that will end up being difficult or impossible to treat effectively. I’m sure that one of the biggest questions is whether or not the pygmy angels are safe for reef aquariums full of corals and other invertebrates. Unfortunately, there is no straightforward answer to this question. As I said, many pygmies will nibble and slurp at the mucus produced by various organisms, particularly stony corals, but the same goes for mushrooms, xenias, zoanthids and a few other soft corals, too. Very few pygmies actually eat these corals, but others can pester them to the extent at which they stay retracted and won’t open up, which can lead to troubles for the coral if a fish is persistent. Tridacnid clams can be literally pestered to death, too, as they typically jerk in their fleshy mantle tissue and close up repeatedly when nibbled, which can lead to their total exhaustion and declining health. Occasionally a pygmy may even bite a little piece out of a clam’s mantle. Additionally, some will bite at fan worms of various sorts, although they seem to leave most everything else alone. Shrimps, hermit crabs, sea stars and other mobile invertebrates aren’t likely to be victims. Having covered all of that, I still have to say that most pygmies do not become problems in reef aquariums, especially if they're well fed, and I’ve kept at least a few dozen of them in reef aquariums. I think I’ve had one in every reef tank that I’ve ever owned, and I also used to put at least one in every customer’s tank back when I had an aquarium installation/maintenance business, with only a few becoming problematic. Many have nipped at invertebrates from time to time, but very rarely has one done anything bad enough to warrant its removal. Of course, some particular species are generally better or worse than others, which we’ll get to momentarily, and each fish of a given species can behave differently, too. Thus, some hobbyists’ experiences and opinions may differ from mine, so I’ll just say that you’re taking a chance by adding any of them to a reef aquarium, but I feel that usually it’s a small chance as long as you choose an appropriate species and keep it well fed. Now let’s run through some of the species you might see offered at shops. As mentioned, over 30 species are considered pygmy angels, but I’ll stick with just a few typically found in the trade today. A couple of good books and online resources are available that provide more information about these and the rest, which I’ve provided below. And as usual, you should look up as much info as you can find about any species before making a purchase. For each species covered here, I’ve provided the maximum length reported at Fishbase.org, but I think it’s pretty safe to assume that their maximum size in an aquarium is usually going to be substantially less. After all, the reported maximum length is the “world record,” and most individuals will be significantly smaller than the record, whether they’re in the wild or an aquarium. 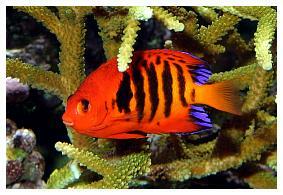 For example, the Coral Beauty angel is reported to reach a maximum length of four inches in the wild, but I’ve seen hundreds of these fish and don’t think I’ve ever seen one that was more than about three. The natural range of each species is also provided, again, based on information from Fishbase.org, along with a few more words about them where applicable. This species is found throughout the West, South and Central Pacific, and can reach about 6” in length. As awesome as they look, opinions and experiences vary when it comes to their hardiness in captivity, though. I’ve generally had good luck with them and always thought they were essentially bulletproof, but some hobbyists have reported total failure. I imagine this is due to where they came from, how they were collected and shipped, etc., but other factors could be involved, too. Aside from that, they haven’t given me any serious troubles in reefs when it comes to invertebrates, but from what I’ve heard, I might just be lucky. Supposedly this species can also be somewhat aggressive toward other types of fishes at times, too. Left photo by James Fatherree, right photo courtesy of John Clipperton. Also called the Blackfin angel, this species is found in the West Pacific and Indian Ocean, and can reach a maximum length of about 6”. It’s also a species that is more likely than some of the others in this genus to cause trouble for the invertebrates in a reef aquarium. Their reputation is not so good there, so I recommend keeping them in non-reef systems only. I don’t think they’re particularly aggressive, although they’re as hardy as any of the rest, and may still make a fine addition to non-reef aquariums. 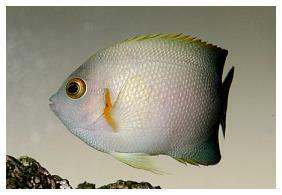 This species is also found in the West Pacific and Indian Ocean and is the biggest of the pygmy angels. They can reach a size of about 7.5”, more than twice as large as other Centropyge. Unfortunately, they’re also another species that may be likely to cause problems if kept with invertebrates, and may also pester other fishes, too. Also called the Two-spined angel, this species can be found throughout the West Pacific and Indian Ocean and can reach a maximum size of about 4”. They’re typically as hardy and easy to care for as they come, and I haven’t had any troubles keeping them in reef aquariums, either. Still, I have heard of instances of them nipping at tridacnids and some corals. 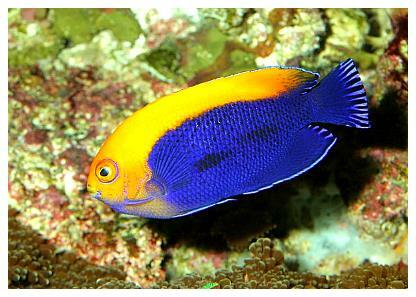 Note that they can also range from being almost entirely deep blue in color to having a mostly orange body, depending on the individual. Also known as the Pearlscale angel, these hardy pygmies also come primarily from the West Pacific and Indian Ocean and can reach a size of 4.75”. Unfortunately, this can be one of the more aggressive species when it comes to getting along with other small fishes, and should be kept with larger tankmates. This is a Central Pacific (Hawaiian) species that can reach 4” in length. 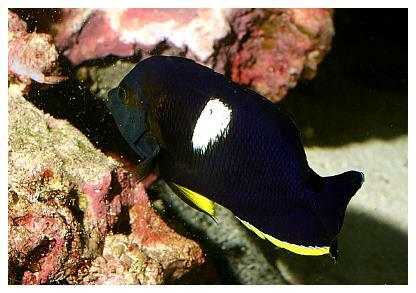 It’s also another more aggressive species, and I’ve had trouble with a couple of them when trying to keep them in reef aquariums; both were nippers that wouldn’t quit. 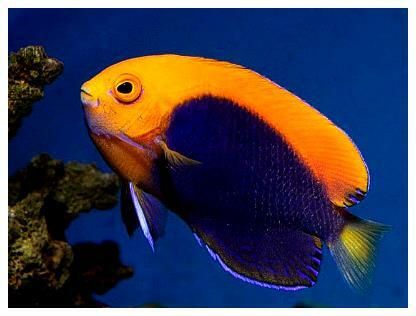 Also known as the Orange angel, this species is also found in Hawaiian waters, but is much smaller than the Potter’s angel. It reaches a maximum size of only a little more than 2.25”, making it the smallest of the dwarf angels. Photo courtesy of John Clipperton. This species is found in the Central Pacific, primarily in Micronesia, the Marshall Islands and Fiji, and can also be found in Hawaii. It can reach a full length of about 3.5”, being another of the smaller pygmies, and is noted for actually eating coral polyps. Unfortunately, as awesome as they look, I haven’t seen many of these offered and haven’t tried one myself. This is the one species of pygmy angel that I’ve seen out of the Red Sea, which can reach a full length of about 5.5", and can also be found in the West Pacific and Indian Ocean. These are supposedly some of the hardiest of the pygmies, and are a good choice for aquariums. Unfortunately, however, their coloration is far from spectacular. This species is found in the West Pacific, can reach a size of about 4”, and is another good choice for an aquarium, in my experience. 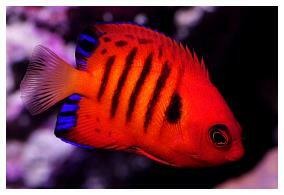 They stay small, are less aggressive than other Centropyge's, and haven’t been problematic in reef aquariums, either. This species is found in the Western Atlantic, Caribbean and Gulf of Mexico, and reaches a maximum length of just of over 3”. 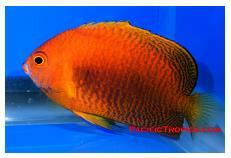 These are small, have not been aggressive, and have typically done well in reef aquariums. This species is very similar to the Cherub angel, but is found only in the southern part of the Caribbean and Western Atlantic down to Brazil. It’s also a little smaller, with a maximum length of just under 3”, and has a yellow/orange color on its back, rather than just its face. 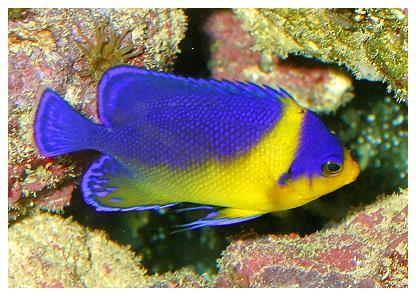 This is another species that does well in reef aquariums, although they reportedly eat sponges. 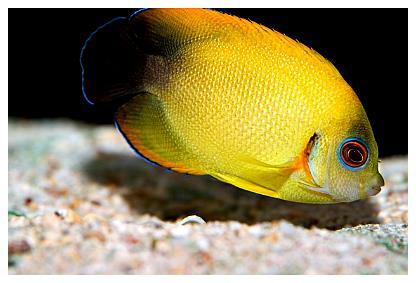 Also called the Orangeback angel, this species comes from the West Indian Ocean and also reaches only 3” or so in length. Despite their small size, however, this is the most aggressive pygmy I’ve ever seen. 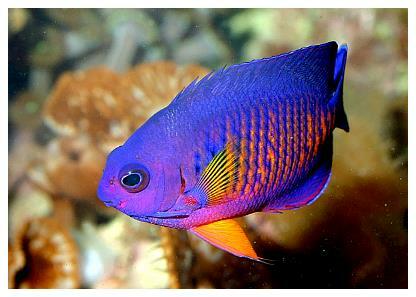 I had one years ago that was every bit as obnoxious as a blue devil damselfish (very obnoxious). Still, I don’t think these are likely to cause any particular problems when kept with invertebrates in reef aquariums. Note that this species looks almost identical to the Brazilian Flameback angel, but it has a clear/translucent tail fin, which makes them easy to distinguish. This species is found in Japan and the northwestern Hawaiian Islands, and can reach a size of about 6”. If you are looking for something that few hobbyists have, this might be the fish for you - but be ready to spend as much as several hundred dollars. Nope, I haven’t tried one of these, either, as they’re well out of my price range. Also called the Venusta or Purple Mask angel, this species lives in the Western Pacific from Japan to the northern Philippines. It reaches a maximum size of about 4.75” and is another angel seldom seen in the trade. Unfortunately, they’re typically found hanging upside down in caves and under ledges, and for this reason are best kept in low-light aquariums rather than brightly-lit reef tanks. Also note that although this is one of the three species in the genus Paracentropyge, some sources (such as Fishbase.org) call it Centropyge venusta. 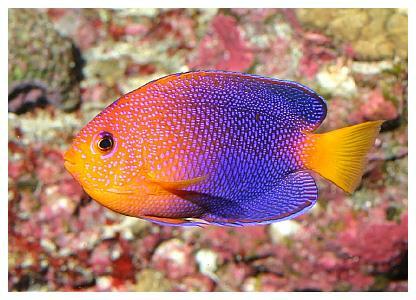 As bright and beautiful as they are, this species is one of the most problematic of the bunch (photo right). They come from the West Pacific and Indian Ocean, can reach a full size of about 5.5”, are likely to bite at invertebrates and are generally thought to be non-reef safe. On top of that, they also tend to be more aggressive than many other species, and generally aren’t as hardy as others, either; not a top pick by any means. Also called the Oriole angel, this Indo-West Pacific species can reach a length of 6” and is the other worst choice, according to most reports. They have a reputation for being notoriously difficult to feed, and are generally the least hardy of the bunch. Poor collection techniques usually get the blame, but some specimens brought in from particular areas are said to be as likely to live as any other species. Supposedly, those from Australia are the best choice. On top of their hardiness issues, they also are more likely than other species to bite at invertebrates, and therefore are best suited for non-reef tanks. Photo courtesy of Bill Cook. At times, various species of pygmy angels may hybridize and produce offspring that have characteristics of both parents. For example, a well-known cross between the Lemonpeel angel (Centropyge flavissima) and Halfblack angel (C. vroliki) is found in areas of the Central Pacific where the Halfblack is rare. It looks like a Lemonpeel angel for the most part, but it has a black tail and/or rear end like a Halfblack angel. I was recently contacted by William Crook, a collector for Pacific Tropics in Hawaii, about his discovery of a new hybrid, too. While diving at a depth of about 100' off the coast of Oahu he spotted a harem of Potter’s angels with a few Fisher’s angels mixed in, but noticed that one looked unique. He caught it and had it identified by several experts, and sure enough, it was a cross between the two. 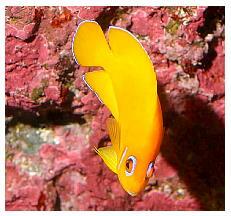 So, you can see that more and more discoveries of new fishes are made all the time. Photos copyright James Fatherree unless otherwise noted. Fenner, R.M. 1998. The Conscientious Aquarist; A Commonsense Handbook for Successful Saltwater Hobbyists. Microcosm, Charlotte, VT. 432pp. Michael, S.W. 2001. 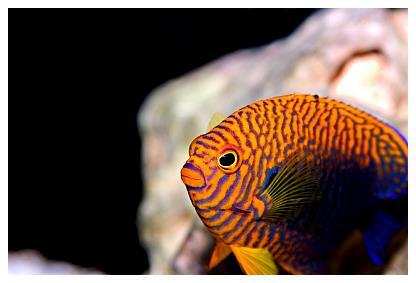 Marine Fishes: 500+ essential-to-know aquarium species. Microcosm, Charlotte, VT. 447 pp. Michael, S.W. 2004. Angelfishes and Butterflyfishes. Microcosm, Charlotte, VT. 344 pp. Schultz, H.C. 2003. What a Darling Little Angel: The Genus Centropyge. Reefkeeping Magazine, (2)1.